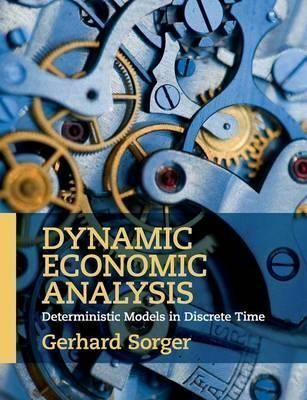 Focusing on deterministic models in discrete time, this concise yet rigorous textbook provides a clear and systematic introduction to the theory and application of dynamic economic models. It guides students through the most popular model structures and solution concepts, from the simplest dynamic economic models through to complex problems of optimal policy design in dynamic general equilibrium frameworks. Chapters feature theorems and practical hints, and seventy-five worked examples highlight the various methods and results that can be applied in dynamic economic models. Notation and formulation is uniform throughout, so students can easily discern the similarities and differences between various model classes. Chapters include more than sixty exercises for students to self-test their analytical skills, and password-protected solutions are available for instructors on the companion website. Assuming no prior knowledge of dynamic economic analysis or dynamic optimization, this textbook is ideal for advanced students in economics.